See that ticker up there? 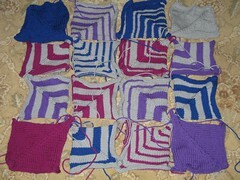 It's been 1 month, 2 weeks, and 4 days since I began taking part in Rebecca's Yarn Focus Challenge. 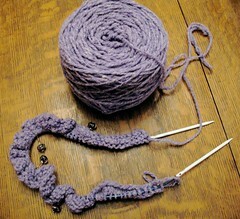 In the YFC, sock yarn does count, but we get to have one day a month to buy yarn. In the first month, I used my day to buy dishcloth cotton for the baby kimono. This month, I splurged a little more. I've finally decided that my next shawl will be Hidcote, so I bought that pattern from Mim, and bought the suggested yarn, Shadow, from KnitPicks. It's really inexpensive (less than $7.50 for a whole shawl's worth! ), so I bought two colors, Lost Lake Heather and Oregon Coast Heather. I like Sunset Heather a lot, too, but I don't need another red shawl. I also dropped by one of the LYSes and came home with some Lorna's Laces Shepherd Sock in the poorly-named (I think) Yellowstone. I think this looks like some sort of spring flower myself. I think I'll use it to make some plain stockinette socks for me. Solid squares in the middle? Or solid squares at the corners? 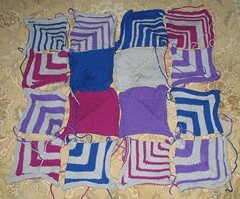 After they're all put together, I'll add a border - probably one row of each color. After much talk about Arwen, I've cast on, using the Beaverslide Fisherman Weight in Wood Violet. I've never made a grown-up sweater, so we'll see how this goes! The second Black Purl sock continues, too - I've got to fly to Harlingen again on Wednesday, so it will be airport knitting. I'm sure no one but me remembers the Flared Lace Smoke Ring from last fall. 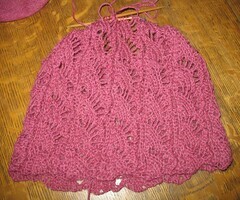 I really wanted it done in time for cold weather, but it got put aside for Christmas knitting. Actually, it and the Black Purl socks were both put aside at that time. 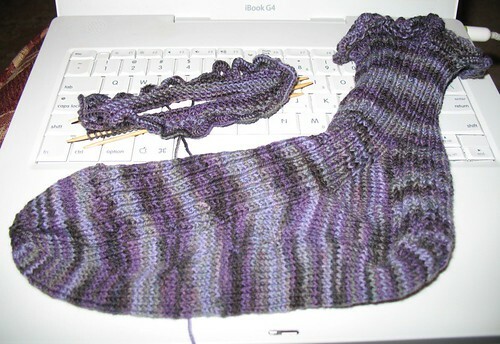 I'm working on it again, but suspect it will be put aside when the yarn for Hidcote arrives. I'm on the fourth and last chart, but I'm guessing I need to do about 14 repeats of that chart - and I'm only on the fourth! It's not really this pink!